We provide bulk orders of Merchant & Happy Gift Cards shipped direct to you for distribution. Perfect for any employee or client reward program. Introducing a new and exciting gift card option: Happy Cards. These cards give recipients the option to use their cards at any or all of six to eight participating brands. And you can benefit, too. 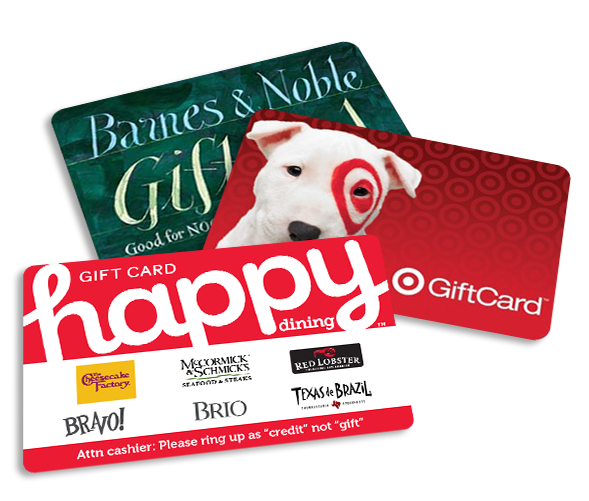 Bulk Happy Card orders are a cost-effective reward card option. You can still give recipients choice, but you won’t pay a premium! Looking for eGifts instead of plastic? *The merchants represented are not sponsors of the OmniCard.com Gift Card Program or otherwise affiliated with OmniCard.com. The logos and other identifying marks attached are trademarks of and owned by each represented company and/or its affiliates. Please visit each company’s website for additional terms and conditions. Darden Restaurants, Inc. owns or has a license to use the Olive Garden®, LongHorn Steakhouse®, Bahama Breeze®, Seasons 52®, Yard House® and Red Lobster® trademarks, and is not affiliated with OmniCard. Use of the restaurant names, logos, or other trademarks requires prior written approval. © 2015 Darden Concepts, Inc.
©2015 Doctor’s Associates Inc. SUBWAY® is a registered trademark of Doctor’s Associates, Inc. (“DAI”). DAI is not a sponsor or co-sponsor of this program. All rights reserved. DAI is not liable for actual or alleged claims related to this offer. Use of the SUBWAY® logos or word-marks must be approved prior to use. Terms and conditions of the SUBWAY® Card apply and can be found at www.mysubwaycard.com.